I recently met with Sid, the owner of Gold Rush Cidery named after the mid-19th century gold rush history in our region. Sid is also the operator, brewer, idea guy, construction, maintenance man and bartender. And has a family. He is also a bio-physicist to boot. This guy literally does it all. Meanwhile, I’m pretty proud if I manage to make my bed and do the dishes in a day. Sid has opened up the first cidery in Medford—and has ushered in a new craft beverage with style and taste. I was familiar with their flagship, Table Rock Cider, a standard but far from ordinary apple cider. Wonderfully balanced between sweet a dry, meaning it can fit into practically any palate. I got a sample tray of all their other ciders. He had an apricot cider, strong nose, mild sweetness with a fairly dry finish. His cranberry cider was great, it took advantage of the natural tartness of cranberries that dances with the sweetness of apples nicely. A crowd favorite I was told. My two favorites (it was hard to decide between the two) were the Ginger Cider and his Spiced Cider. The former was a great dry ginger flavor (not that sweet ginger I seem to find everywhere) that had a great spicy ginger finish. The latter was an amazing cider concoction made with various spices we attribute to the holidays: nutmeg, orange peel, cinnamon, etc. To create the cider, he essentially makes a mulled wine, then mixes with the cider itself. A long and meticulous process that requires a lot of energy and, more importantly, skill that Sid pulls off expertly. The cider is one of a kind and the work shows. It’s great. 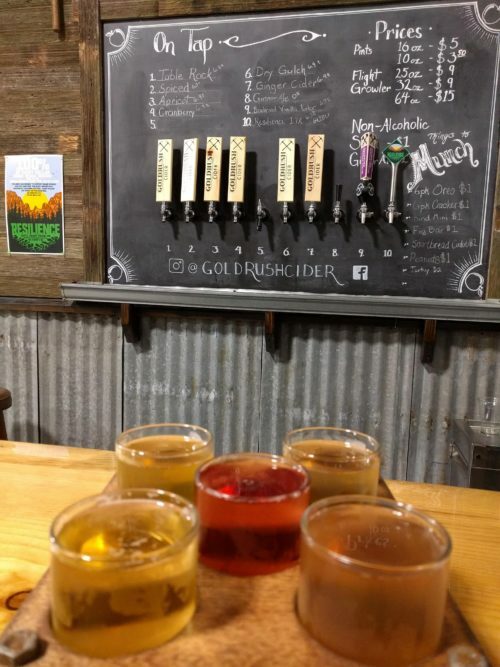 Gold Rush Cidery just opened up their tasting room 10 weeks ago. It’s an open space, with plenty of table room and all sorts of games. Part of Sid’s process for opening the cidery was ensuring that it was a family friendly establishment. His motto for the cidery “two families, one community.” A nod to the two families backing the business for the enjoyment of our community. He wanted a spot not just for the drinkers, but a place for the kids as well. He servers non-alcoholic ginger ale as well as an assortment of other no-proof beverages. There are board games, coloring books for kids and even a dartboard behind a pair of old furnace doors made at the turn of the century.